Austal USA was awarded two of the three Littoral Combat Ships the Navy can buy in Fiscal Year 2019, further increasing the number of Independence-variant LCSs the Navy will ultimately have in the fleet. The Navy awarded contract to build LCS-36 and LCS-38 to the Mobile, Ala.-based company on Friday evening. In a Monday statement, Austal highlighted the unprecedented calendar year it has had, delivering three LCSs and being awarded a total of four new ships, including two FY 2018 ships that were awarded in mid-September. “To be awarded two more LCS contracts before the end of the year is beyond exciting,” Austal USA President Craig Perciavalle said in the statement. 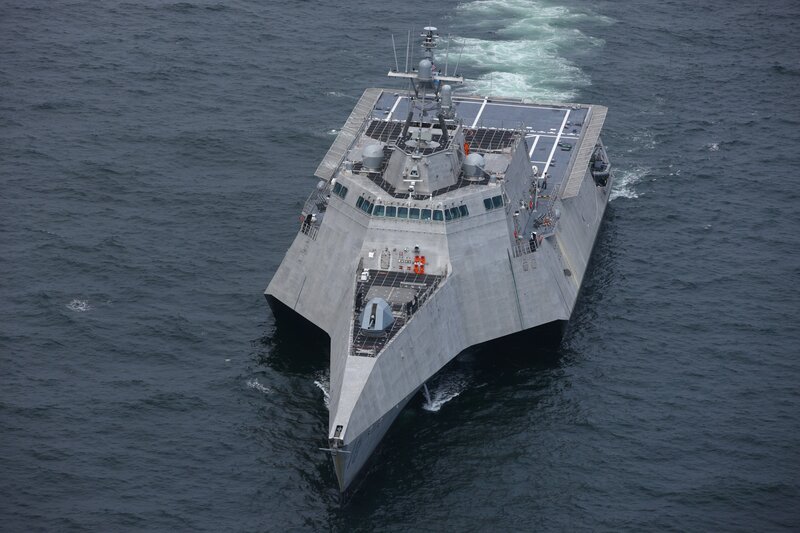 Though the Navy in the early days of the LCS program awarded equal numbers of Independence-variant LCSs to Austal and Freedom-variant LCSs to Lockheed Martin, Austal has in recent years been churning out its ships faster and for a lower cost, according to several sources. With Friday’s award, Austal now has 19 LCSs built, under construction or under contract, whereas Lockheed Martin has 15. Austal has five of its even-numbered LCSs under construction – 20, 22, 24, 26 and 28 – and hulls 30, 32, 34, 36 and 38 have now been awarded. At Lockheed Martin’s production line at the Marinette Marine shipyard in Wisconsin, odd-numbered LCSs 15, 17, 19, 21, 23, 25 and 27 are all in various stages of construction and testing, with LCS-29 under contract but not yet started at the yard. Just one ship remains to be awarded before the Navy transitions from the LCS to the frigate – either LCS-31 or LCS-40, depending on which company is awarded the contract – and negotiations between the Navy and industry are ongoing. “Based on the nature of the ongoing competitive procurement for the third FY 2019 LCS, the Navy is unable to release detailed information at this time,” Naval Sea Systems Command spokeswoman Colleen O’Rourke told USNI News today.